Discovery Point’s Kindergarten & 1st Grade program offers an innovative approach to learning with engaging project-based lessons. Our program is designed to individualize curriculum to meet each of our student’s academic needs. Our curriculum also offers a strong focus on social and emotional development, to prepare your child both academically and socially to take their next steps into their next grade. 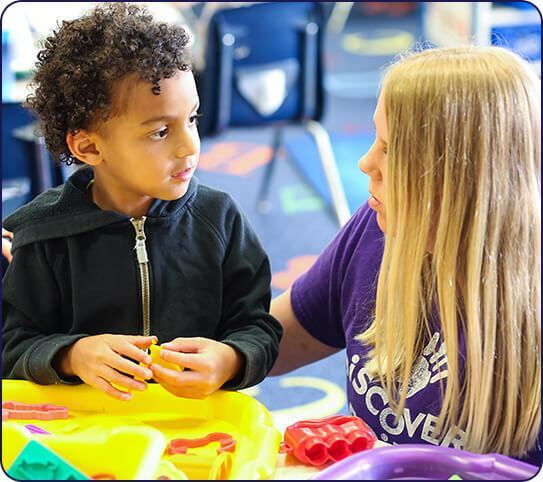 Discovery Point kindergarten students will learn in a small group environment that allows for individualized instruction, as well as provides the benefits of group learning. Our students get to learn about the world around them through a hands-on approach as we work through projects and experiments. This allows the students to gain insight and detail into each area of study while promoting critical thinking and self-motivation. Houghton Mifflin Harcourt’s Journeys literacy program utilizes the Common Core State Standards as a basis for the program, ensuring that these exceptional standards are met during every lesson. Our teachers are given the opportunity to engage with and educate young students in a very effective and efficient manner. This ultimately leads to improved understanding and success! Houghton Mifflin Harcourt’s GO Math! program takes a comprehensive approach to helping children in kindergarten and 1st grade learn important mathematics skills. The program has been developed in support of the Common Core Standards for Mathematics, making it reliable and effective. Young students will develop an understanding of critical math areas through our interactive lessons, paired with research-based teaching styles, instructional resources based on a broad range of learning styles, and various other best practices. With Houghton Mifflin Harcourt’s Science Fusion program, students are given the opportunity to truly dive into science, rather than simply listen to a basic lecture on science topics. We encourage young students to utilize their curiosity, develop their problem-solving skills, discover science concepts for themselves, and ultimately interact with and apply everything they are learning in the science program.